Hi Meggan. This is delicious! I used green onion because that is what I had. It was really good before I got it into the fridge to meld the flavors. Can’t stop picking at it. Hope there is some left to go with dinner. Another keeper. Thank you. Thank you so much, Julie! Really, any kind of onion tastes great in this. And I really prefer chopping green onions vs. other onions, so good call there! Everything else makes me cry. :D I have been eating this for breakfast all week. Is that weird? Like you say, can’t stop picking at it. My 1-year-old is also addicted. So glad you loved it. Take care! This is delicious and I don’t know anybody who does not like it. Last timber made it, it was a casserole. Not all hat great. But as a dip oh yeah! I’ll make mine drenched in good seasons Italian dressing because that’s what I love. This Is a versatile mix with endless possibilities. if you use italian dressing then what do you omit? and how much dressing do you use? Hi Chastity! Thanks for the question. If you want to use Italian dressing, you omit the olive oil, sugar, white wine vinegar, chili powder, and salt. I would start with about 1 cup of dressing and see if you think you need more. What you should do is add the dressing and then taste the salad to see if you like it. 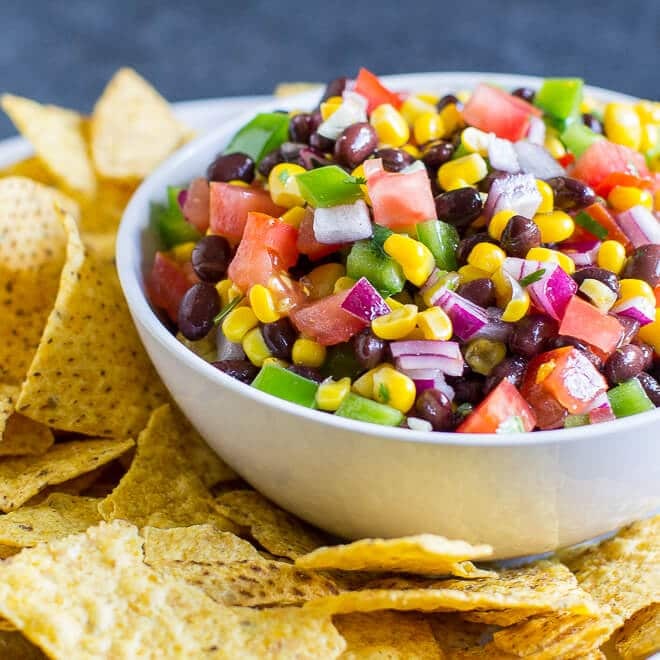 Cowboy Caviar has a sweetness to it, so if you use Italian dressing you won’t have that (but it will still be delicious). You could try adding 1 tablespoon of sugar to the bowl and see if you like that, and add more if it tastes good to you that way. With a salad like this, it’s okay for you to change it and make it taste the way you want it to! I hope this is helpful. Take care and thanks again! I just use any kind of Italian dressing but I also add in those baby pepperoni’s you can get in a package. Makes it taste even better! FINALLY! After teasing us with pictures of your adorable baby eating this, I finally get to try it myself. ;) If it’ good enough for her, it’s good enough for me! WAIT – hold the phone. You eat something besides cake?! Yeah Charlotte and I ate most of this ourselves, we didn’t really share with the boys. Thanks for visiting, you are the sunshine in my universe! Really nice party recipe staple! This looks so tasty I can hardly stand not having some to eat right now. I can see hogging the whole bowl all to myself. Thanks for a wonderful recipe. Cook time of 1 hours minutes is posted with the recipe. What is cooked? The “cook time” is actually the “chill time.” You need to have this sit in the refrigerator for an hour so the flavors blend. There isn’t really a way to call it “chill time,” it’s just “cook time.” Sorry for the confusion. Basically I wouldn’t want to say this recipe takes 5 minutes to make and then have someone be upset that I didn’t account for flavor-blending time! This looks delicious! Other than as a dip, what would you recommend to eat this with? Hi Sylvia, thank you! :) I personally like to eat it with grilled chicken or any kind of grilled meat. It’s also really good on tacos/burritos if you’re in to that sort of thing. I hope you enjoy it! Since a serving size is a cup, it’s already “dressed,” and it has 5 grams of protein, I would chop a bowl of romaine lettuce, throw a cup of the “caviar” into the bowl, mix it up, and enjoy my super-healthy lunch … or dinner! Yum! This sounds amazing! I am currently preparing meals with as little sodium as possible. Do you believe cooking dry beans and then cooling them would yield the same results? Hi Leah, yes absolutely. I think the beans usually aren’t quite as mushy, but that isn’t necessarily a bad thing. :) Thank you for your question! The first list confused me. It read 1 3 cup cup sugar. Luckily I read through the entire blog and saw the 1/3 cup cup sugar. Might want to proof read before sending. I have the same problem with Indy correct. Drives me nuts! I can hardly wait to make this. Sounds delicious. Thanks. ? I hope I didn’t offend you with my proof reading mention. I just always miss a correction, then go nuts trying to fix it. As for your Xavier. I am sitting in bed in a hosp. With pneumonia. Hungry. Hosp. Food is gross. All I want is a bowl of this Xavier and tortilla chips. Mouth watering, and stomach growling. This looks delicious and would love to make it. I do have a question though, do you think I could substitute the green bell pepper with finely chopped celery hearts? Green peppers and I don’t get along to well, but the red ones do not bother me….go figure. I’m so sorry to hear that, John. This is exactly the way I always had it and I like the sweetness, but I understand not everyone would. I’m sorry again! Amen, John! I made this according to the recipe and I ended up draining off all the liquid I could and remaking it with a tablespoon of sugar and a quarter cup of lime juice instead. It was still overly sweet from the residual sugary dressing, but much more palatable to my tastes. Next time I make this, and I will, I’ll do only the 1 tablespoon sugar and add the quarter cup lime juice. The lesson I learned: listen to your intuition as you cook! Meggan, other than the sugar I love this recipe and thank you for it. Glad you were able to make it at least edible, Tammy! All I can say is, I have posted a warning about the sugar. :) It really comes down to personal taste. I’m glad you’ll make it again, it really is great! And it’s true it doesn’t need the sugar to be delicious. I’m just sharing the classic recipe which happens to be quite sweet. Take care! Was the problem just its sweetness alone? Reducing the amount of sugar that is put into I’m sure would help or removing it all together because you have the SWEET corn already. Hi! the recipe I have for this doesn’t have any sugar in it at all so you could probably leave it out entirely. And mine is made with zesty Italian dressing. Definitely a favorite in my book! I made this today. I had to double the recipe because a lot of people were coming over. I should not have added extra sugar, it made it too sweet. First time to double it, won’t add the sugar next time. Or was there something I did wrong? Hi Tracy, I think it must come down to personal taste. Another reader commented today that he thought it was too sweet, but this is exactly how we ate it growing up and still the way we eat it today. And be “we” I guess I mean everyone I know in the Milwaukee area. If you doubled the vinegar and olive oil, doubling the sugar shouldn’t have been a problem. I will make notes for people to go easy on the sugar though. I’m sorry it didn’t work out for you! You definitely didn’t do anything wrong. This is absolutely delicious, thank you so much for sharing. It’s going to become my staple for BBQ’s and parties for sure ? Hi Carol, general storage times for leftovers are about 3 to 4 days, and I think Cowboy Caviar would be good for that long. I hope that helps. If not, just let me know! Thanks! Thank you Meggan. Love your recipes! Just wondering if anyone had tried coconut sugar or pure maple syrup to replace the white sugar? I am definitely going to experiment with this to make the recipe totally raw, plant-based. Yum! Hi Amy, I think that is a great idea! I have been thinking the recipe needs a makeover. I mean, I love it with the sugar but I could eat it all the time, constantly, if it didn’t have all the sugar. :) I will definitely post any updates I figure out. I hope you find something that works for you too! I loved the sugar but didn’t have any white wine vinegar-let me tell you that red wine vinegar works just fine! I am from Texas and living in Mississippi and I give my stamp of approval but it is probably like BBQ sauce, spaghetti, and chili-everyone has a preference and no way is every the same! Hi! I was wondering if you can make this in advance? Like the day before an event or do the veggies get gross? Hi Erika! I think you can make this the night before without problems. I have for sure enjoyed leftovers for a couple of days after without issue. Just in case you have a higher standard for such things, though, you could chop all the vegetables the night before and have them in separate containers, mix up the dressing, and just toss it together shortly before serving it. That would be your best option if you’re worried. Thank you! How many people will this race? Hi Julie, I have 12 servings listed in the post which is a rough guess. The recipe makes about 3 quarts of Cowboy Caviar which is 12 cups, so that’s assuming 1 cup per person. I’d say it’s a rough guess because it might depend on how big your onion is or things like that. And of course, it depends on how much your guests each. This is the size recipe I would make for a potluck where there are other dishes around and people will be grazing. I hope this is at least somewhat helpful. Good luck! If you have other questions just let me know. Thanks. Just used this as a starter recipe, changed quantities and a couple of things and…. Wow fantastic! Really good base dressing idea and a really flexible recipe! One to keep. Likewise, did limited sugar, because the corn gave that sweetness. Great, Frances! I’m so happy to hear that. :) You’re right, the corn gives sweetness. Glad you could make it work for you! I made this last night and it was a HUGE hit with my husband, 6 year old, and especially my 18 month old! We loved it! It was delicious and so easy to make! Thank you for the recipe! Awwww yay Leah! I’m so happy to hear that! It’s a huge hit in our house and I’m so happy to share the joy. :) Have a great weekend! I made this today. (left out the sugar) My husband ate a bowl as is. I sprinkled a little crumbled goat cheese into it. YUM! And so healthy. Thank you! Does anyone have nutritional information on this. Yum! Made this today for a potluck–doubled the recipe except kept the dressing the same–it is delicious! Thank you for this keeper! I tried this recipe for dinner last night, and it was so refreshing! My husband even enjoyed it. Thank you! Thank you so much, Laurie! I am so happy to hear that. It’s a huge favorite in our house. :) Have a great week! Thanks Jill, you and I are obviously on the same page here. :) Have a great weekend! I am making this now. A friend brought this recipe to a group and everyone loved it! :) I was wondering how long will it keep in the fridge? I am the only person in my home that will eat it. So I am just wondering if I can have a week of lunches or if I need to share before it spoils. Thank you! Sounds fantastic. I was at a grad party and the host served this but instead of sugar, she added one can of crushed pineapple for the sweetness. It was very addicting! THAT sounds like a genius idea. It’s perfect, it really is. It would give the sweetness plus pineapple is just delicious. Great idea! Does this stay nice & fresh if I make the day ahead? Hi Amy, I would say the veggies (the peppers, mostly) lose some of their crunch if they sit over night. But, I still think it tastes delicious. If anything, you could mix the salad dressing part separately and assemble a bowl of all the beans and veggies, and just toss it together at the last minute. That should preserve the freshness! Thanks! I have never left a comment before, but here we go! My son tasted Cowboy Caviar at Costco a few years back and I was floored he went back for seconds. He’s not a huge veggie eater. Needless to say, they stopped carrying the product and life went back to normal. Last week I found this recipe on Pinterest and thought, “why not?”. Well, I will tell you that I’ve made it twice this week and it will be on our menu indefinitely. I took out the cilantro because I hate it. And my kiddo won’t touch a tomato to save his life, so those are gone too. But it didn’t alter the taste at all. BRAVO! I am uber thankful and impressed. Hi Jill! This is all so wonderful. It is one of my favorite ways to eat veggies too, and also to convince others to do so. :) I had no idea Costco ever carried Cowboy Caviar either, that’s so interesting. Yes, ditch the cilantro! I do the same thing for my mom. You made my day, maybe even my week, so thank you so much for sharing your story. :) Take care! This recipe is absolutely delicious. I ended up not adding the sugar at all and added a clove of minced garlic to the dressing. It was so good…it even tasted batter the next day!!! Thanks for a great recipe!! Hi Catherine, I’m so glad you liked it! Yes, it’s pretty delicious even without the sugar. Like a fantastic bean salsa, I think. Especially with that garlic mixed in! Glad you made it work for you. :) Take care! I made this for a cookout this evening and it was a HUGE hit! Friends of mine had made “cowboy caviar” but said they hadn’t had it as good as this recipe! The midwest version is a keeper. Thanks for sharing! Hey Lindsey! That’s great news! :) I’ve seen other versions of Cowboy Caviar too, usually more like regular bean salsa or sometimes with avocado. I love this sweet version and I appreciate that you gave it a try! Also happy to hear everyone liked it. That’s not always the case. :) Take care and thank you so much! I just made this tonight as a trial to see if it would be good for an engagement party I’m hosting for my daughter this summer. I’ve got to say it is yummy as is, I made it as directed. It is so fresh tasting! Thank you for sharing! Hi Theresa, that is SO great to hear! Smart of you to test the recipe in advance, just in case. I’m glad it’s going to work out for you. Congratulations to your daughter, how exciting! :)) Take care and thank you!! I have to say I have never used cilantro before. I am telling you to sniff it at the store and if it smells like soap leave it there. I thought well maybe it taste great but oh my goodness I had to throw the whole bowl out cause it all tasted soapy to me. Hi Jessie, I am so sorry to hear about your troubles. 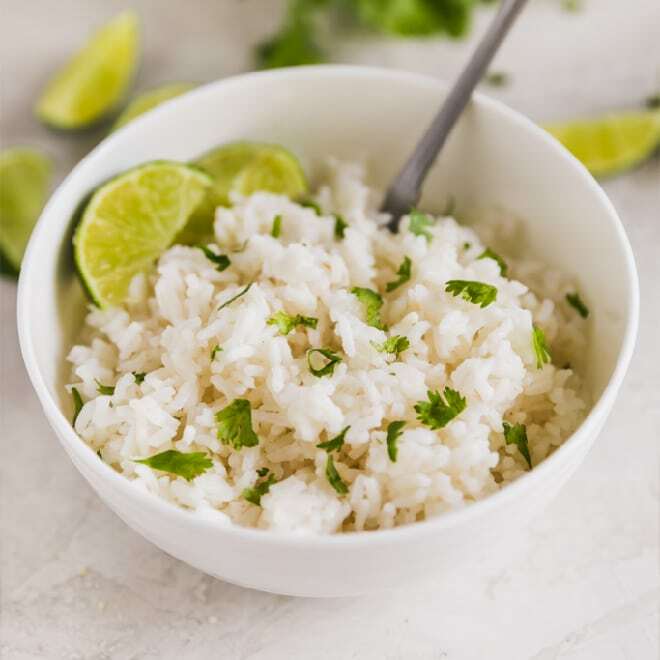 Basically, there is a gene in some people that causes them to think cilantro tastes like soap (my mom has this gene, so does Ina Garten, and it sounds like you do too). So, it will be all cilantro that strikes you this way, not just some. I would suggest just leaving cilantro out if you make my recipe or any others, because I don’t think you will like it under any circumstances. You could also substitute parsley if you want to but it is not necessary. For those of us who like cilantro, we can never get enough. I will update the recipe to say that parsley is also an option. I am sorry again for your troubles! Take care. I sure wish cilantro was not in the recipe . I’m one of t,he people that follows a recipe exactly. If you change or add to it it is a different recipe. Anyhow I wasted a lot of stuff and next time I will leave cilantro out and will not put the dressing on till time to eat. Great recipe!!!!! Everyone’s tastes are different and l found this recipe way too oily!!! No worries, l rinsed the dressing off with water and started again. This time l added 1 tsp chilli powder, 3 tbls lemon juice and a table spoon of maple syrup. Amazing!!! Thanks so much for sharing!!! My son is a vegan and l’ve never tried black eyed peas until now. I will be adding them in more of my recipes. Thank you, Carol! I’m so glad you were able to make it work for you. I do think it’d be easy to leave the oil out of this, and I’m glad you were smart enough to rinse it off and start over rather than just wasting it. Good job. :) I will definitely try your variation; it’s a lot healthier! Especially for people who are vegan or not eating refined sugar. Many thanks. Take care! Love it! I think this amount of sugar is perfect. I make my Cowboy Caviar different each time I make it, a lot depends on my mood. I’d never added sugar before but now that I’ve tried it this way, I can’t wait to do so again. As a Kentuckian, I tip my hat to you Midwesterners, you nailed it! Joi, you’ve made my day! Thank you so much. :) I appreciate that you tried the recipe and I’m so happy it worked out for you. Have a great weekend and thanks again! We took this to old school cookout in Pittsburgh. Ribs, brats, and burgers. This was the vegan option. Inevitably, it was a big hit. Thanks, Aunt Tammy! AWESOME! I love that this is accidentally vegan. LOL! Ribs, brats, and burgers… my stomach just growled. Thanks for sharing your story. :) Glad it was a hit. Happy weekend! I made this today with a few changes. First, I omitted the sugar altogether. Sugar takes this healthy dish and turns it into an unhealthy dish, IMO, and is completely unnecessary. It adds no nutritional value to the recipe yet feeds the sugar frenzy that most SAD’s are fueled by. Next, I used red wine vinegar because that’s what I had on hand. I only used 1/3 cup olive oil because these ingredients are going to make their own liquid and I don’t want a drippy dish. I used red, yellow, and orange peppers to really give it a good visual. Lastly, I used cumin in place of the chili powder to give it a more southwest flavor. This turned out fabulous and I will make this again. These are great changes! I have made Cowboy Caviar too with red wine vinegar and it’s one of my favorite changes. I completely understand on the no sugar front, that’s a wise choice although I aim to present the dish in its original form which is why I included the sugar. But it’s always good when people adapt to their own needs, that’s really what it’s all about. Just finding the inspiration for something and then making it exactly the way you might love it. And it sounds like it worked out for you so that’s great! Thanks for sharing all these ideas, I especially want to try to cumin. Take care. Can’t wait to make tonight and serve at our fam jam tomorrow! I’m going to sub stevia in the raw (by half) for the sugar. Anyone ever try it with apple cider vinegar rather than white wine variety? Just curious. I’ll be slow cooking a BBQ pork roast and thought the flavor of apple cider would compliment the pulled pork sammies! Do you know how many calories are in a 1 cup serving? Hi Rachele, I don’t know! I don’t really compute calorie information right now, although it’s clear to me that everyone wants this information. So, I’m trying to figure out the best way to go back and add it. Sorry about that! Hi Rachele, I’ve now added a nutrition label for this recipe. It’s calculating 194 calories for a 1-cup serving (not including chips). It might be just *slightly* high because it assumes all of the dressing in the recipe is consumed, while in my experience a lot ends up at the bottom of the bowl. But, at least it gives you a pretty good idea of the calories. Thanks for your question! This was amazing!!!!! I could live on it!!! Oh yummm!!!!!! Perfection!!! Hi Sandy, I really have no idea! I don’t know anything about canning or whether special ingredients/methods are required. I used to have a guide to canning around… if I find it and learn anything, I’ll email you. Wish I could help more! Im in London and I made your dish this week to celebrate summer and as an interesting alternative to boring salad and served alongside steak. I eliminated the sugar altogether and also used raw corn straight from the cobb. It was absolutely delicious! I don’t think the dish needed any additional sweetness – the peppers and corn added enough in my opinion. 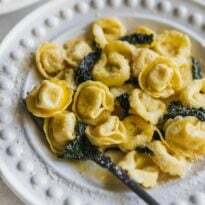 Great, great dish and I have already passed it along to a load of friends who will be enjoying the dish across the pond this summer. Thanks again! Hi Susan, I’m so happy to hear that!!! Makes my heart sing. :) It’s true, the dish doesn’t really *need* the sugar. That’s just the classic recipe. I love when people modify it to their taste, and I’m positively tickled that folks in London are enjoying Midwestern food. That’s just the best! Thanks again!!! This looks great Meggan! I can’t wait to make this for my nephew’s birthday party that’s coming up! This is just what I was looking for! Thanks for sharing! Thanks Sue! I hope you enjoy it. :) Happy birthday to your nephew! Wowwweee!! Oh my goodness! Had this at a birthday party and my hubby and I LOVED this! !Now I have to make it all the time! My hubby requires it to be in the fridge at all times! Have given batches to a lot of people and they ask for the recipe and, of course, I give them your site! I do want to say that my hubby doesn’t like me using sugar, so I only put in half the sugar and may try honey the next time. Keep the fantastic recipes coming and THANK YOU to Aunt Tammy! Thank you so much Carol! That’s all just so fantastic. :) I appreciate you spreading the word about my little ol’ blog! I think other readers have used honey in the recipe with great results, and I’m planning to try that myself at some point. Just so I can write in the variation! Thank you again for your kind words and support. :) Take care! I normally don’t comment on many recipes but I have to say- this is great! I’ve had it before but never made it and it turned out great. I don’t think it was too sweet at all! I only added half the sugar to the dressing at first, but after tasting it decided it was still too bitter with the vinegar and oil so added the rest of the sugar and it is perfect. Doesn’t taste at all sugary which I was worried about after reading some of the reviews. (I am also in the Midwest- MN here!) it’s just like all of the other recipes o have tasted before- actually I think it’s better! Thanks!! So great to hear Melissa! Makes me so happy. :) I love MN and was in Minneapolis/Hanover at the beginning of July. It’s one of my favorite places! Anyway, I’m glad you enjoyed it and it worked for you. And yes – all the sugar for me, please. :) Thanks for leaving your thoughts! We up in Michigan don’t use the sugar at all. nor does it have the red or green peppers. Instead, we have avocado, tobasco sauce, white not sweet corn, green not red onion, and only the black beans. I’m excited to try this version! LOVING your variation Kelli! Especially the avocado. :) Thank you so much for sharing! I have an intolerance to corn what would be a good sub? Hey Carol! You could just leave the corn out entirely and not worry about it, or you could add another bean (or bell pepper) in its place. Another commenter added pineapple instead of sugar, that sounds pretty good to me too! I feel like diced up cucumber would also work. Good luck! I have been making Cowboy Caviar a lot this summer. The recipe I use is very similar to yours. Each time I make it, I add something a little different. It depends what is in the fridge. In fact, I just made a batch to take to my cousin’s for tomorrow. We are going to be making several batches of pear strudels. We are going to need to snack on something to keep our strength up. Lol. For the dressing though, I have been using a roasted garlic olive oil with balsamic vinegar that I purchased at the Houston Livestock Show & Rodeo. That stuff is AMAZING! I use it in everything. Roasted Garlic Olive Oil with Balsamic Vinegar….?!?! That sounds AMAZING!!! Pretty sure I could drink that straight. And yes, I’m so happy you throw “whatever” in your Cowboy Caviar, not everyone is comfortable doing that but it’s such a good way to be! It’s different every time, you can use stuff up, and you don’t get bored. Pear strudels? Sounds exhausting. :) Good luck to you! Thank you so much for sharing! Hi Meggan I have yet to make this and looking forward to it. My question is,,if I were to use dry beans and soak them would you know the quantity? I have a big bin of 7 beans and would like to soak them and use them for your recipe but I am uncertain how much I should use. Any idea??? Would I have to cook them after I soaked them? Clearly I have not done this before…lol. Hi Joanne! First, you will definitely need to cook the beans after you soak them. The package should tell you how to cook them (it’s probably something like, boil them for an hour, or faster if you use a pressure cooker although I’ve never used one myself). I looked up the conversion of dried beans to canned beans. You’re replacing 2 cans of beans (the black-eyed peas and the black beans), and it looks like 1/2 to 3/4 cup dried beans = 1 can of beans. So, it’s up to you if you want to use 1 cup total or 1 1/2 cups total. Depends on how many you’re feeding, I think! There will be MORE than enough dressing/sauce if you want to go with 1 1/2 cups of dried beans and cook those up. Good for you for putting your giant bag of beans to work! Good luck and thanks for your questions. I love to feel useful. :) Take care! Can I substitute cannelini beans for black eyed peas? Hi Cassandra, yes absolutely! Sometimes canned black eyed peas are hard to find, so just substitute whatever you have on hand or can locate. Cannelinis are great. Thank you so much! Love this! But, here in New Mexico we add green chillis to everything. So, I added some chopped roasted mild green chillis and made a double batch hoping for leftovers (there are 4 of us). No such luck! Finished it in one day. The kids asked me to make more tomorrow…. Green chiles are great in this recipe! I’ve tried it myself. They are good in everything, like you said. :) I cannot believe the four of you ate A DOUBLE BATCH in one day. Wait – I can believe it. So happy to hear that, thank you Pam! I make this all the time, love it! Side note: try substituting apple cider vinegar for white wine vinegar, gives it a nice tangy bite! I usually add the juice of 1 lime as well, it brightens up all of the flavors. Also makes an awesome topping for scrambled eggs or omelettes. This has been a family favorite for years!!!! Just made this Cowboy Caviar and it’s delicious. The sweetness reminds me of Three Bean Salad. Thank you! Hi BB! Three Bean Salad is on my list to post next, it’s really good. :) Thanks so much for trying my recipe and I’m glad you enjoyed it! Take care. I tried this at a birthday party yesterday and it was amazing! And I don’t usually like beans! The version I had also had chick peas in it and they used Garlic Expressions dressing and marinade. I think there are a lot of variations you could do with this recipe. Hey Karen! I will definitely have to seek out that dressing, it sounds fabulous. So glad someone made Cowboy Caviar! It’s so good and like you said, the sky is the limit! Have a great week! I have made your cowboy caviar (with less sugar) several times now. Everyone loves it! This is great for parties and potlucks because it won’t go bad (or taste bad) if you can’t keep it chilled the whole time. Thank you so much for giving me a delicious way to eat my veggies! Hi Nadine, that is so great to hear! And you are right, it’s nice to have something that won’t spoil because of mayo or whatever. It is definitely the best way to eat vegetables and beans! :) Thanks so much for trying the recipe and I’m glad you like it. Wow, really love this salad! (w 1T sugar, and a jalapeno!). Found this by accident when I was looking at your ancho chile powder technique (from poblano peppers, we have a bunch growing), and made it to surprise my wife. I bookmarked this site to find some more treasures! Thanks. Can’t wait to make this, thanks for sharing. Always looking for a new side for myself, or for impressing my guests! I love your blog! Keep up the good work! Would you consider this more of an appetizer or a side dish? Looking forward to trying this. Thank you! Do you think it would be ok to freeze the leftover? Hi Nadine, I am not sure it would hold up well. The flavors would be fine, but I suspect the texture would be quite mushy after freezing and thawing. I wouldn’t really recommend it. Thanks for your question! This a great healthier option! Love it! Colors are fantastic, and flavors awesome! Thanks Bec! I’m planning to try it soon with coconut sugar for those who prefer that. :) Thanks again! Loved this recipe for new year’s potluck appetizer! Used 1/4 cup sugar and a 1/2 tsp of black pepper but otherwise made exactly as you have it. I agree the sugar it partly what makes this “cowboy caviar” vs. a more tex-mex style recipe. It also makes it kind of a special treat. Thanks ! Thank you so much Melissa! I’m making it myself, too. You must be from the Midwest if you love the sugar too. :) I think just that little tweak makes it so good and different. Happy New Year! To be true to the recipe I made it pretty much exactly like it is written. I did substitute Poblano pepper for about 1/3 of the bell pepper. My red onion was too strong apparently because it overpowered the dish. I too found it to be too sweet with 1/3 cup of sugar unless using it strictly as a relish. I’m not crazy about black eyed peas so using this as a relish to mix with the black eyed peas we also had for new years made both dishes more palatable. I would make this recipe again but with only 1/2 the sugar, maybe less. I just made this for the first time and absolutely loved it! 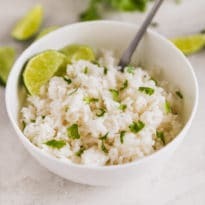 I left out the cilantro because my husband hates it, and as you recommended I started with only a tablespoon of sugar and I found that to be perfect! I think if you are looking for more of a salty savory flavor, one tablespoon of sugar is perfect! Will definitely be making this again and again, thanks so much!! Thanks so much for your comment, Ashley! Glad you started off small on the sugar and loved it. :) And yes, leave out the cilantro if someone isn’t a fan! It’s the easiest thing to do and nice to have one less ingredient to buy. :) Take care and thanks a lot! OMG this stuff is delicious and addicting! And we love the sugar in it…we use every bit of the 1/3 cup (plus a tablespoon or so more…we are from the south :)! It is the perfect combo of salty, sweet and fresh! I can’t get enough of this stuff! I have found that sweet italian dressing works really well instead of the sugar and vinegar….It’s sweet, but not too sweet. 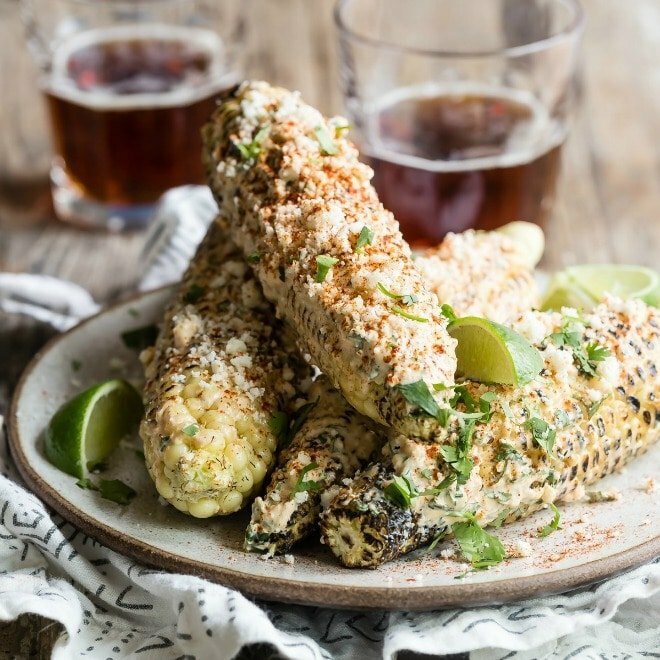 We tried this recipe at our housewarming party this weekend and loved it (no cilantro for us though)! One of the most popular items at our party! We loved it. We will definitely be making this again! We also shared the recipe on our blog too (with credit given here of course)! Awwww that’s so great to hear, Jason! Yes, cilantro is the best thing to leave out if you hate it. :) Thanks for the link back and I’m so glad you liked it. It’s a favorite around here! Take care. Hi Stephanie, there are way too many comments for you to go through them all, but I feel like tons of people have subbed honey for the sugar. I have tried it myself too and loved it! I will add a recipe note to that effect. Thank you for your comment! I make this every week, never change one thing and it’s just the BEST! Sometimes I mix a serving of it with chilled Quinoa for a quick lunch, I serve it with Tostito Scoops and often we just eat it as a relish with our meal. This one is a Winner Winner Chicken Dinner for sure!!!!! Thanks so much for posting. P.S. I’m from Nashville, so I’m a Southern lady and the sweetness of it is just perfection! Disappointed with the last “Texas Caviar” recipe I tried, I’m going to give this one a whirl because the ingredients look more in line with what I expect. Although, most recipes I have eaten or have made use Tiger Sauce for the seasoning. Have you ever tried it in this recipe as a substitute? Hi Marcia, I have never heard of Tiger Sauce! But I looked it up and it looks AWESOME. I was curious where you are from and if that is a regional condiment. The only thing I noticed is (at the least the recipe I saw) it has no sugar. My Cowboy Caviar is quite sweet, so please tread lightly if you are worried about sugar! Anyway, I am definitely going to experiment with tiger sauce and see where it leads me. I appreciate the info and I hope you aren’t disappointed in my cowboy caviar! Take care. I made this the other night and it was literally gone in 10 minutes! I did read some of the reviews and only added 1/4 cup of sugar. Thank you so much for sharing this recipe! I will be making it all summer! Thanks! I used about 2 tsb sugar & added Xtra chili powder, jalapenos and garlic (sorry, just us Texas essentials ) My only suggestion would be adding dressing to taste instead of first, was way too much liquid for me, saved mine with 8 sheets of Bounty. Couldn’t get the stars to work but a 4 or 5 for sure. Yes to all of this! You’re right, the dressing should be to taste. I love Texans. :) Thanks Donald! This is a great recipe! I reduced the sugar and added some fresh ginger and cubed avacado……..yummy and so healthy. Can’t wait to try it. Got hooked on the one Costco carries. Theirs is sweet too. This turned out deeelish!! It’s so fresh and healthy!! I changed the dressing a bit by reducing the sugar to 1 Tbs, reducing the oil to 1/4 cup, adding fresh garlic, cumin, paprika, dried jalapeno flakes, lime juice, and a dash of Tequila [hope you don’t mind….I’m a TexAZ girl]. I’m taking it to a dinner party tonight as an appetizer (served with tortilla chips). I hope there’s leftovers….mmmm lunch!! No, no, no. I’m from Wisconsin too and would never dream of using so much sugar! Obviously Wisconsin has people who watch their sugar intake! :) I just happen to not be related to A-N-Y of them, I guess, ha ha! Can’t wait to make this for our work “BBQ Challenge”. I am a Cheesehead also and totally off the sugar! Yay for me and them too! As I am sure they will enjoy this delectable dish as much as I will making it. Thanks so much for sharing! Cheeseheads 4Ever! And yes to no sugar, I mean, I eat sugar but I strive to eat less. Or none. It’s hard! But you inspire me to keep trying! As long as you don’t swear off cheese, we can be friends. :) GO PACKERS!!!!!!! I made this with balsamic white vinegar instead of white wine vinegar? Do you think it will taste ok? :/ Just realized this mistake. Thank you!! Hi Courtney! Sorry I was gone all day and couldn’t reply to you until now. You should be JUST FINE with white balsamic! Honestly, any kind of vinegar is good in this recipe. It doesn’t really matter. No sweat! I hope you think so too when you try it. :) Thank you! Sorry again for the delay. I made this with no sugar for a Minnesota potluck. It went over great! #MinnesotaPotluck is my new favorite hashtag! :) Thank you so much for letting me know! Take care. How far ahead can you make this??? Hi Glenda! A few of the fresh veggies might soften a bit in the dressing if you make more than a day in advance. I would certainly feel good letting it sit overnight, and there is no risk of anything turning bad if you let it sit in your fridge for 3 or 4 days. If you want to make it that far ahead, though, and you’re worried about softened peppers, you could always prep all the ingredients and the dressing and hold them separately and toss it together an hour before you need it. Or the night before you need it. I hope this makes sense! Thank you! This Recipe is Excellent! No need for “See Notes”! The Balance between the Sweet and and Chilly Powder With Oil is Perfect. You cannot please everyone…… Will Always be Haters out there. 5***** stars from Me! Love, Love, Love! I am making it for the 4th time. I don’t like things super sweet so I just put in 1 1/2 t. of sugar and it was perfect. Perfect ingredients and it tastes so fresh! I am actually making it right now as we speak! One thing I did add was a teaspoon of chipotle chili pepper. I love a smoky flavor. Don’t really know if it really changed the taste though, LOL. So addicting. 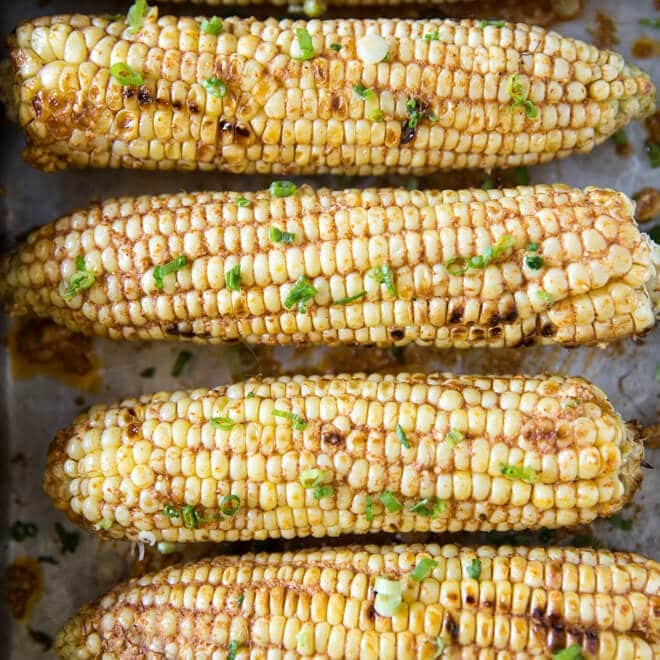 Love this dish in the summer because it’s so cool and crispy, but here in Michigan we eat it a lot more in the winter months, because we get sick of all that heavy potato-y cheesy stuff. As for a topping, my whole family much prefers just a wee bit of yum yum sauce. Try it. Haven’t tried this yet but I am from the Midwest(Mn & WI) and have never seen it with sugar. Will be willing to try but will cut back on the sugar. I’ve always seen it made with Italian dressing either store bought or homemade. My recipe calls for a couple of chipotles in adobo sauce. And hominy in place of the corn. Though I have used corn and prefer it. I threw a cowboy caviar concoction together tonight and THEN found your recipe. As it was it was passed around 3x! Next time I’m making your recipe Meggan. Seems everyone likes it….alot! What I love is that these ingredients are pantry/refrigerator staples, so it’s quick to put together as a side dish for home, or to bring to a potluck/party. I was a little scared to add ANY sugar so I tested it first with a small serving. WOW! Yummers! I added a scant 1/4 cups of sugar and I believe my company will really like this. That is if it lasts until tomorrow….nice recipe. Thanks! I made this yesterday. I used chili lime seasoning. I also used a food processor for the veggies, but they turned out pretty mushy. Next time I will not use the processor. Something is missing. It was YUMMY but needs something. I love your changes! The thing about canned fire-roasted tomatoes is, the fire-roasted-ness adds SO much flavor, and you don’t have to do anything extra to get it. Plus it saves you on the chopping time. Same with Rotel – more flavor with less work. And I love that you added jalapenos! Amazing, thanks for the comment Terri! Has anyone ever made without sugar? I am pretty sure people have, you’d just waste your life digging through the comments to find out. 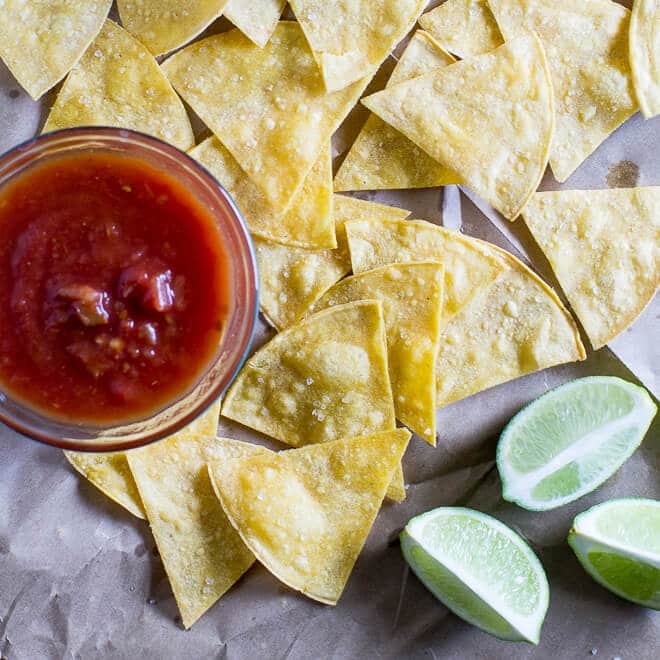 It would basically be Black Bean Salsa without the sugar… which is amazing!!! You could use red wine vinegar and lime juice instead, if you wanted. That’s how I make my black bean salsa. Delish. Thank you! Yes. A few times. It was good! Loved loved loved this recipe! I made it for my mother-in-laws visit and she commented on how delicious it was too. I was worried about the sugar but didn’t need to be. Tasted great but I did use fresh corn and sauteed it quickly instead of canned super sweet corn. I’ve pinned it and it’s a keeper. Thank you for this recipie. I make it often for potlucks, where it’s always a hit! .It’s great just the way it’s written, but today I’m adding a chopped garlic scape cause they’re growing in the back yard. I serve this as a side dish. Added chopped avocados. As for the Dressing, I used omitted the vinegar and sugar and used fresh lime juice, minced garlic, smoked paprika and cumin. So GOOOOOOD! Note to self: added 1/4 tsp honey dijon mustard to dressing for emulsifier …..keeps it from separating. This is one of my favorite dip recipes! I love how healthy, fresh, and delicious it is! Why would you want to have all these advertisement printed on the recipes when people want to print them out? It took 7 pages to print out when it shoiuld have taken 2. One picture is enough! I won’t be using this site again, as there are several others that have versions of this recipe that are more practical to use. I will take your word that you won’t share my address. Hi Cheryl, I’m sorry about that. You need to use the “print recipe button” (it’s located in 2 places, immediately at the top under the recipe title and then again in the recipe card). If you just print the whole post, the whole post will print. Best of luck to you, and no, I definitely won’t share your address! I can delete it out of the comment after I reply. Sorry again. Hi again Meggan! I’m off to outback Australia next month and remembered how much we loved this recipe. Because I can get a hold of all of the ingredients easily out there, make a batch up and keep it for a few days in the fridge for days we are too busy to cook much. I am going to my pin it to my list for the trip plus take the recipe I printed out too for when we have no power and am eating under the moonlight. Love your blog! I don’t understand why the person above had an issue with printing it out. I got one page with zero ads. How long is this good for once it’s been made? I like it without the sugar. I added fresh lime juice in place of the vinegar. Hi Meggan. This is my first time reading and posting to your site. I came here via Nagi’s Recipe Tin Eats site, where she has a rice salad recipe she claimed was inspired by this Cowboy Caviar recipe. Keeping my post short, I live in MA, and found the amount of sugar to be too high; 2 TBS (1/8 cup) was perfect. I’m not judging – this is simply what I prefer, and definitely understand how people would enjoy more/less sweetness. I also like the complexity of THIS recipe. I’ve had plenty of similar salads/salsas, but this makes a good side dish (as well as a dip for chips); the addition of avocado makes sense too, though I haven’t tried this yet. During the hot weather, I’m always on the lookout for side dishes which can be prepared and eaten cold for a few days – and this fits the bill perfectly. Thanks! This cowboy caviar is amazing!!! We make it for all our neighborhood gatherings. There are never any leftovers. Use the dressing the recipe calls for (italian dressing would change/ruin the amazing flavor). Everything is spot on except for the onion. Personally I love onions, but half the amount specified would be ideal for me. Or perhaps using a sweet onion instead. I made this today. Since we are on a low carb diet, instead of the sugar and vinigar, i did a little olive oil and chilli powder. Also added chopped green chilis. The k8ds love it a little spicy and so do i. Thank you for the base recipe.